ReNew Economy has an update on tidal power company Atlantis - Atlantis buys out 398MW tidal project as it aims for Asia market. 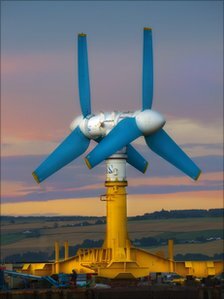 The Australian-founded and managed tidal energy company Atlantis Resources Corp has bought 100 per cent of the 398MW tidal wave energy project in Scotland, the largest in Europe. Atlantis, a marine turbine company which was formed in Australia but moved to Singapore to better access finance, bought the outstanding shares from GDF Suez and Morgan Stanley, the investment bank which owns a majority stake in Atlantis. ... MeyGen recently received offshore planning consents from the Scottish government, which aims to be 100 per cent renewable by 2020. The first turbines are expected to be installed in 2015.